BlueStacks for Windows 7 - a full emulator android platform. The application uses the hardware of the computer, allows you to deploy a full version of the operating system with support for google play, standard methods of authorization and operation. The functionality of the utility includes tools for the use of manipulators and shortcut keys, supports full-screen and windowed display mode with the ability to change the resolution. The emulator is able to run any games and programs, it contains the ability to open root rights, generate a virtual SD card and synchronize settings via cloud storage. 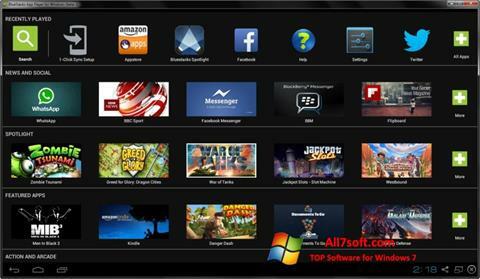 You can free download BlueStacks official latest version for Windows 7 in English.